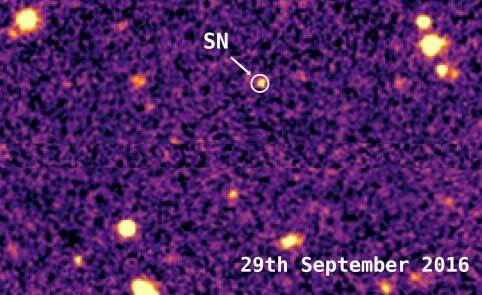 (Nanowerk News) An international team of astronomers led by the University of Southampton has confirmed the discovery of the most distant supernova ever detected – a huge cosmic explosion that took place 10.5 billion years ago, or three-quarters the age of the Universe itself. As detailed in a new study published in The Astrophysical Journal ("Studying the ultraviolet spectrum of the first spectroscopically confirmed supernova at redshift two"), light from the event has taken 10.5 billion years to reach Earth, making it the oldest supernova ever discovered and studied. The Universe itself is thought to be 13.8 billion years old.